WASHINGTON - Special counsel Robert Mueller's investigation did not find evidence that President Donald Trump or members of his campaign conspired with Russia's efforts to sway the 2016 election, delivering a boost to the president in a case that has shadowed his administration since its first days. Trump immediately declared the findings a "complete and total exoneration" of him. "It's a shame that our country had to go through this. To be honest, it's a shame that your president had to go through this," Trump told reporters Sunday before returning to Washington from Florida, where he had stayed all weekend. Mueller's investigation also concluded that Trump's campaign received "multiple offers" of assistance from people linked to Russia. Barr said that Mueller concluded that neither Trump nor other Americans had joined those Russian conspiracies. The evidence Mueller's team gathered "does not establish that the President was involved in an underlying crime related to Russian election interference," Barr's letter says. That determination was part of Barr's decision that the president could not be prosecuted for obstruction of justice. A Justice official, who was not authorized to speak publicly, said that Barr did not consult with Mueller while preparing the summary letter. Barr indicated that his determination that Trump's conduct did not constitute obstruction was made without regard to the constitutional considerations of whether a sitting president can be prosecuted. Long-standing Justice Department guidelines state that a president cannot be charged while in office. The attorney general's obstruction conclusions are likely to cast a new spotlight on Barr, who had had written a memo critical of Mueller's obstruction inquiry before he was nominated by Trump to succeed Jeff Sessions at the Justice Department. In the 2018 memo, which he sent to White House lawyers and was a major focus of inquiry at his confirmation hearing, Barr wrote that Mueller "should not be permitted to demand that the President submit to interrogation about alleged obstruction." Democrats in the House of Representatives immediately signaled that they wanted to know far more about the facts Mueller gathered, and Barr's conclusion that Trump had not committed obstruction. Rep. Jerry Nadler, D-N.Y., chairman of the House Judiciary Committee, said lawmakers would summon Barr to testify about "very concerning discrepancies and final decision making" in his letter. The delivery of Mueller's findings ends a weekend of anticipation in Washington, as lawmakers and the White House awaited the findings of an inquiry that shadowed the first two years of Trump's presidency and could shape its future. Mueller's findings seemed destined to fuel a highly political fight unfolding against the backdrop of a presidential campaign - with a crowded field of Democrats vying to unseat a president who has been tailed by criminal investigations almost since he took office. Although the summary of Mueller's findings lifted a cloud that has been towering over Trump's presidency, the special counsel's probe produced a cascade of other criminal investigations targeting people around Trump, which have not yet concluded. Barr's summary described a massive investigation by Mueller's staff of 19 lawyers. The special counsel's office issued more than 2,800 subpoenas, executed nearly 500 search warrants and interviewed about 500 witnesses. Mueller's investigators also obtained dozens of communication records and requests to foreign governments for evidence, the letter states. 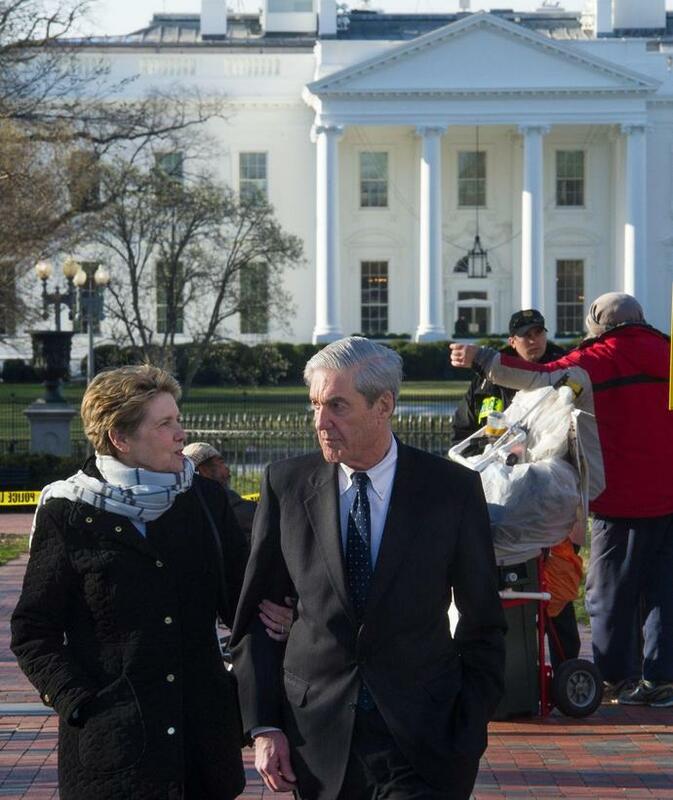 Mueller's report, delivered Friday to Barr, signaled the end of an investigation secretly launched in the months before Trump was elected, when the FBI began gathering clues that made them suspicious of aides to Trump's campaign. The probe mushroomed to include whether the campaign coordinated with Russian efforts to interfere in the 2016 election, and whether the president himself attempted to obstruct it. It also disclosed that some of Trump's aides worked eagerly to benefit from that operation, seeking damaging information from Russians even as Trump was seeking out business in the country. At least a half dozen of Trump's aides, who were charged in the investigation, then lied to Congress, federal investigators and the public to downplay those connections. The now-completed probe, however, did not result in charges that anyone associated with Trump coordinated with the Russians, and a Justice Department official said Mueller's report did not recommend that anyone else be indicted. But lawmakers in both parties want the bulk of Mueller's evidence released. Republicans seek to vindicate the president. Democrats want to bolster investigations into the Trump administration and his namesake business. Lawmakers from both parties have said they want to see not just Mueller's report, but also the evidence he gathered during his investigation. Trump aides were convicted of lying to Congress or federal investigators; campaign-finance violations; tax evasion; and bank fraud. High-profile convicts included Michael Cohen, Trump's longtime personal lawyer and fixer, and Michael Flynn, Trump's former national security adviser and a member of his campaign staff. Trump's onetime campaign chairman, Paul Manafort, also was convicted in one case and pleaded guilty in another. And longtime political adviser Roger Stone is facing trial in November for allegedly lying to Congress about his interactions with the anti-secrecy group WikiLeaks, which prosecutors said served as a conduit for Russia to distribute stolen emails. But the investigation did not charge anyone on the campaign with cooperating with Russians to influence the election. For part of the weekend, Trump quietly awaited Mueller's findings at his Mar-a-Lago resort in Palm Beach, neither commenting nor tweeting for much of Friday and Saturday.